I totally needed this weekend. It was the first one in several that I haven't spent all weekend running around doing errands. I hate super buys weekends packed full of "have to do's" with very little "want to do's" accomplished. Since I had dedicated machine time, I decided to catch up on QAL's. First up was the block above, the Aurifil BOM. 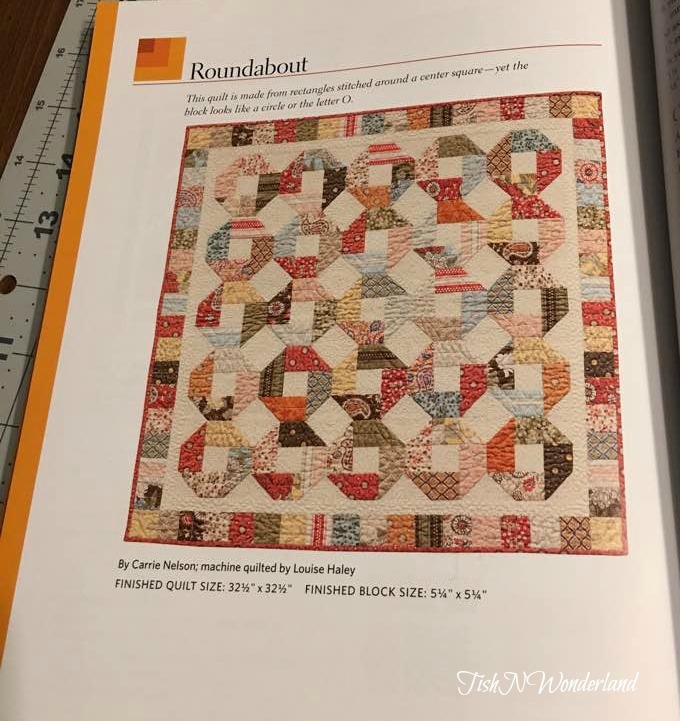 This month's block was called Sunflower Power and was by Vanessa Goertzen (you can read more about her in Pat Sloan's interview here.) 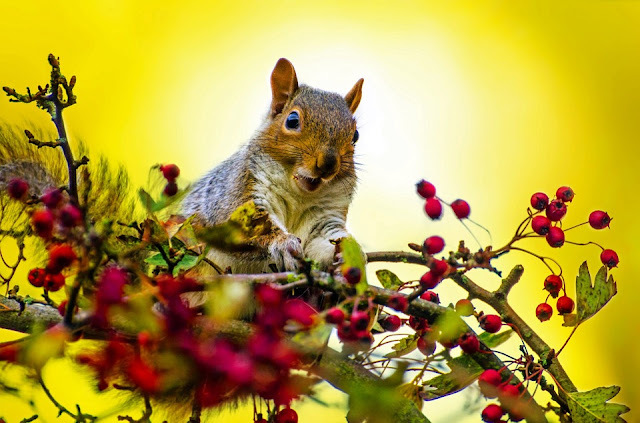 All those bright sunny yellows sure did start the weekend off right. Next up was the 9th block in Cindy at Stitchin At Home's Medallion BOM. Last month I introduced black into the color palette of my blocks by pairing it with green. This month, I went for it again, but with purple. It may be one of my favorite blocks in the quilt so far. I still have a block to make for The Children's Library BOM, but will make it next month when the last block comes out. Then I can piece the entire quilt together. I've decided to play along with Yvonne at Quilting Jetgirl's Wayward Transparency QAL. Last weekend I picked out fabrics for the smaller version. I ended up with some lovely Kaufman Quilter's Linens in blue. I admit I was a bit worried about the contrast between the light and medium tones. 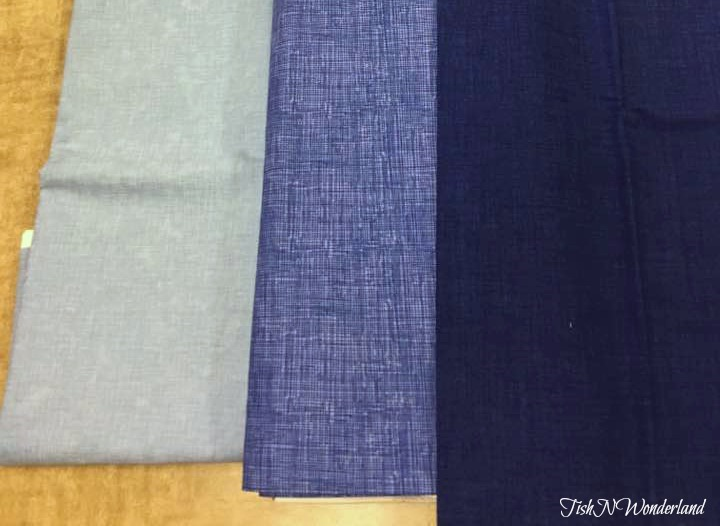 The dark blue on the bottom was for binding. 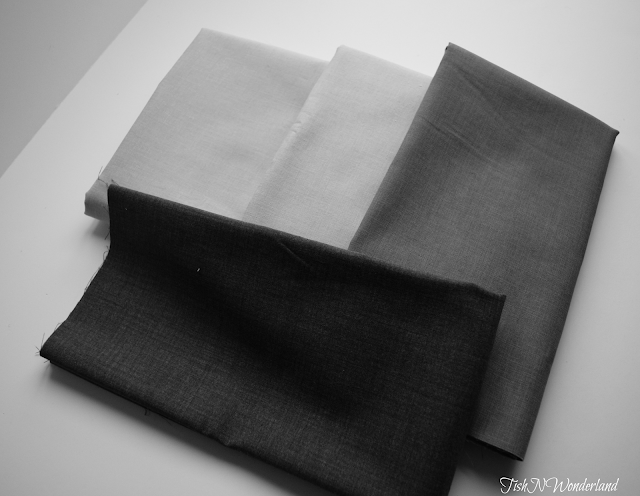 Yvonne published a wonderful post last week about evaluating fabric contrast. Following her advice, I added a black and white filter to my picture to evaluate it. As I feared, the light and medium fabrics basically read the same value wise. So I made a quick trip to my local quilt shop to see if I could find a fabric that would work. After auditioning a few different fabrics I finally settled on one. Though not a Kaufman Quilter's Linen, it still has a linen feel to its print. I'm not sure this picture does it justice, but I believe it will work wonderfully in this quilt. 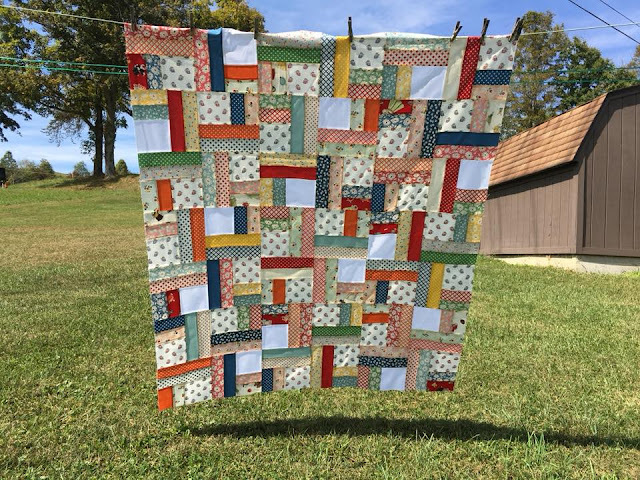 I spent the rest of my weekend working on the strip quilt from last weekend and I am happy to say that I am officially a little over 2/3 finished with it. I brought out the design wall for a little bit of help. 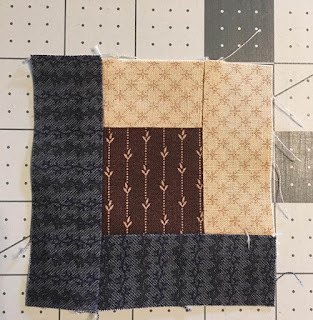 I'm trying to keep things looking random and scrappy with these 10 patch blocks. Why does random take so much planning??? I have to say I'm happy with the way the blocks are turning out. I have two more of these super sized blocks to finish and then I can show you my finished top. Then it will join all the other unfinished tops. Is there a Guinness World Record for most completed quilt tops laying around? and then cut into some beautiful civil war reproduction fabrics he picked up last weekend to start a log cabin wall hanging. So lots of thread flying off the spool this weekend at our house. Hopefully, even more will be flying this week. I'm grounded! I have to finish quilting the butterfly quilt. It needs to be finished by October. So I'm going to say good bye for now. If I catch myself writing this post, I will probably be in trouble. Last weekend was all about the jelly roll and making something with them. I pulled out all the jelly rolls in our stash and snapped a quick picture. I needed to do a bit of inventory before I decided which one to cut open. Funny enough, the two half rolls and the roll they are setting on in the far right of the picture where the lucky winners. David decided to break into his jelly roll quilt kit using Hop, Skip and Jump by American Jane and I broke up to very old rolls that I believe came from Joann Fabrics. The pattern I used also called for a jelly roll in solids. Nope do not see any of those in my picture, so off to the store to quickly pick up enough of a solid fabric to cut strips. A small confession here...I've had this Go! cutter for almost a year now (David got it for me for Christmas) and I have never used it. Gasp! I know. He's actually used it several times. I decided to break it out and take advantage of the 2 1/2" strip dye. Holly cow, did that save time. I think I cut enough strips for a jelly roll in maybe 15 minutes. Might have been less time actually. With everything gathered up and a few more cuts, I was ready to start this quilt. Thank goodness our daughter headed off to her homecoming dance, things got pretty hot, hot, hot at our house. We were spicing things up in a big way. Stripping. Yes you read that right. Stripping. We decided to make use of our time alone and strip together. Wait, what where you thinking? Strip with each other, not for each other. (Sorry I just had to go there) As the weekend came to an end, I found myself with some completed strip sets and David almost had a completed quilt top. I'm continuing to piece on the quilt this week, since having adequate quilting time seems to be a bust. Maybe it will turn into a completed top by the weekend. Blocks are starting to form. I think I'm going to keep the pattern a secret until it starts coming together. Keep you guessing. 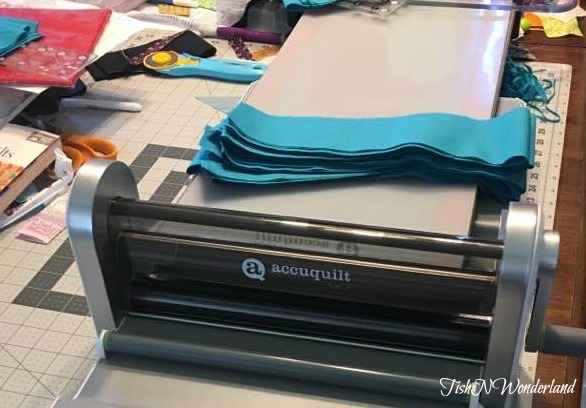 Now on to my next quilting confession...two jelly rolls worth of strips may have started turning into quilts, but what do I do??? Buy two more of course. While killing time between doctor appoints in Morgantown, we headed on one of our favorite quilt shops, Country Roads Quilt Shop. Peggy, the owner, has her jelly rolls on sale all week and I just had to handle them. 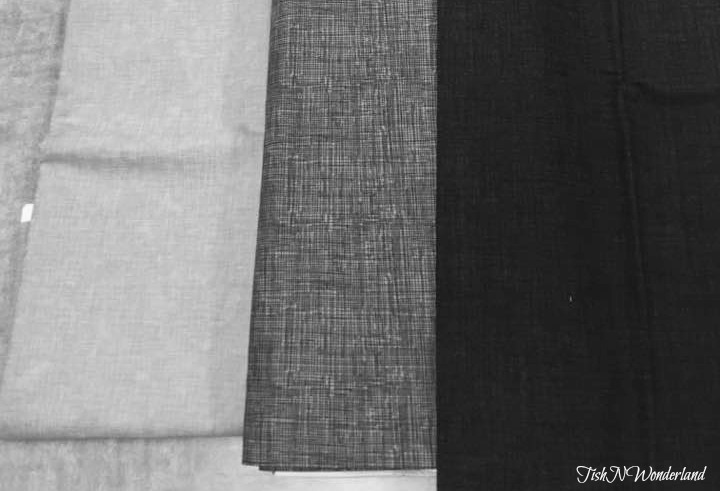 Who doesn't love fondling fabric?? These lovely pinks, blues and grays with the gold print caught my eye right away. The line is called Meow or Never by Erin Michael. I had to have it. I love puns and buns and this is like both! I also kept coming back this little Christmas jelly roll. I think it may actually become a for sale quilt once it's finished, but only time will tell. So two rolls out two rolls in equals right back to where we started from, but I'm ready for jelly roll day 2018. Did you strip this weekend? Is your stash less one roll or did you celebrate by stocking up? I'd love to hear about it. Where to start with this quite unexpected finish? This little quilt is a UFO from a little ways back, basted and forgotten, until now. There is a whole bunch of things that leave me scratching my head as to the existence of the quilt at all. Like why did I buy this charm pack? A good sale maybe? I couldn't even remember the name of it. After an image search of the fabric turned up nothing on google, I turned to Pinterest with the words "Moda Fabric whale tales," and low and behold the third image was from this charm pack. That lead me to the words Sea Salt. Then back to google with "Moda Fabric Sea Salt" and bam, this picture and the fabric line name...Salt Air. How is that for blind luck? 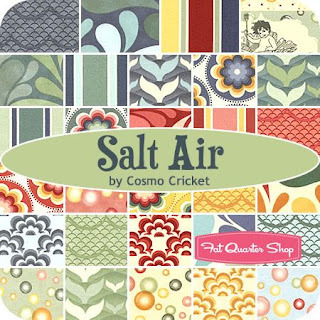 I'm guessing this fabric line came out in 2012 (based on finding a pattern featuring the fabric on Moda Bake Shop). 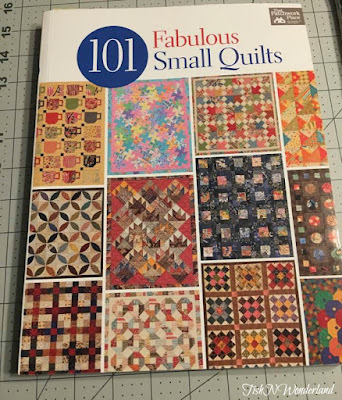 I probably pieced the quilt top around 2013/2014 after purchasing the book 101 Fabulous Small Quilts by The Patchwork Place. No clue why, but I decided to piece this little charm pack into a relatively quick and easy pattern called, Roundabout. There appeared to be some sloppy seams as I quilted it, and I vaguely remember there being some partial seams involved i the quilt's construction. But hey, we all have to start somewhere. 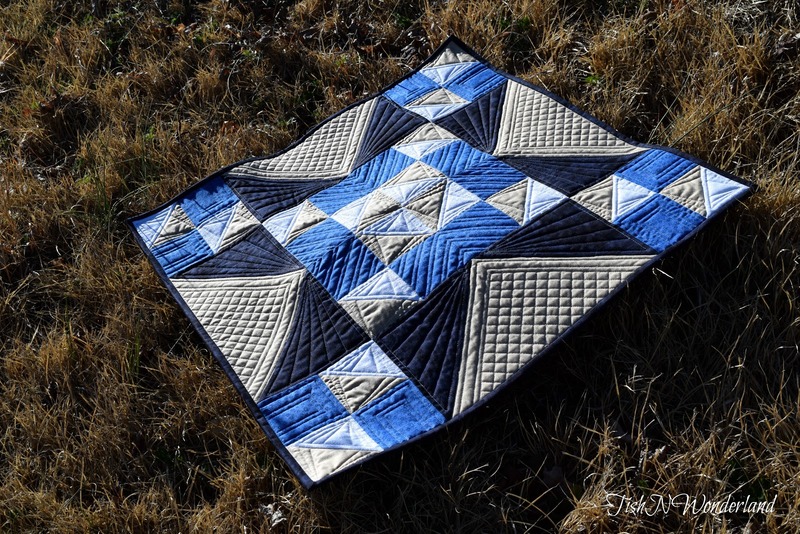 And so the story of this quilt pretty much goes into a coma after being pieced. 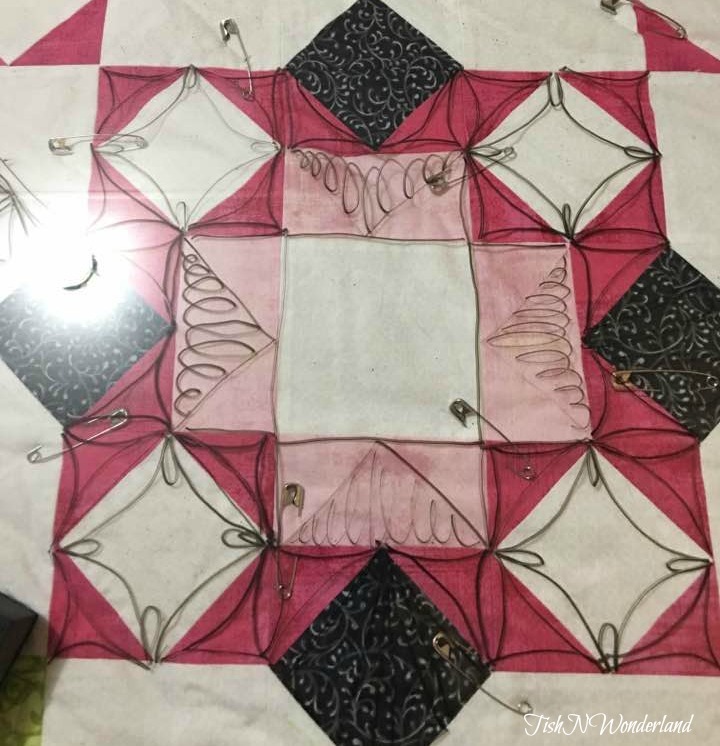 After making a list of UFO's at the end of last year, I was feeling super pumped and decided to baste several quilts in the early spring. If it's basted you have to quilt it, right? Wrong. It's still just been hanging out in a pile waiting. 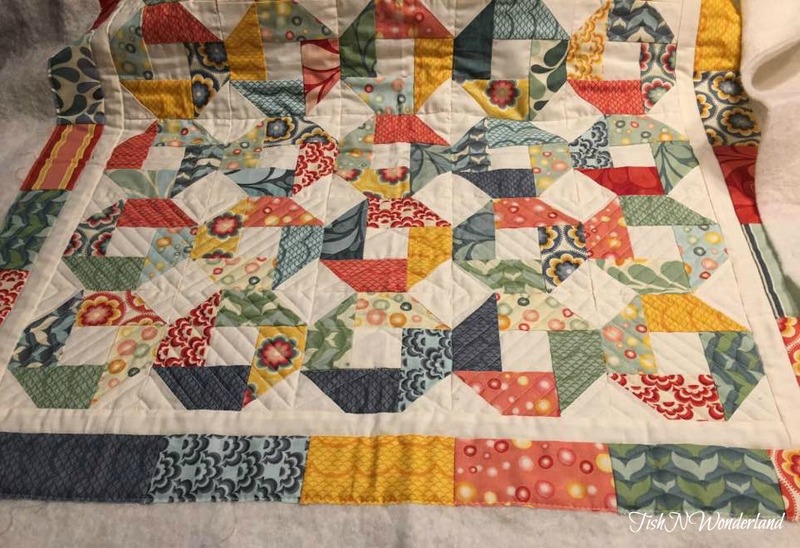 I have had zero and I mean ZERO quilting inspiration when it comes to this quilt. Is it bad that I felt nothing...yikes, that sounds harsh. To my surprise on Sunday, he presented me with this drawing as a quilting option. Well, now, isn't this interesting. I kind of liked it. It's different. He offered to quilt it, pointing out it would take him longer than it would me to accomplish it, but since is was getting late I wanted to think on it. By the next morning, as much as I loved the drawing (wouldn't this make a great mini quilt too! ), I wasn't sold on all those lines with the "o" shapes. So I messaged Sandra at mmm!quilts with all the information and she had the same reaction I did, it needs curves or swirls or something. Taking into consideration we share a brain, I had to ask myself, are we right? I like to preach, "there is no wrong way to quilt a quilt." So was I being a bit of a hypocrite, even though I wasn't feeling it? I came up with a second test, Julie at Pink Doxies. 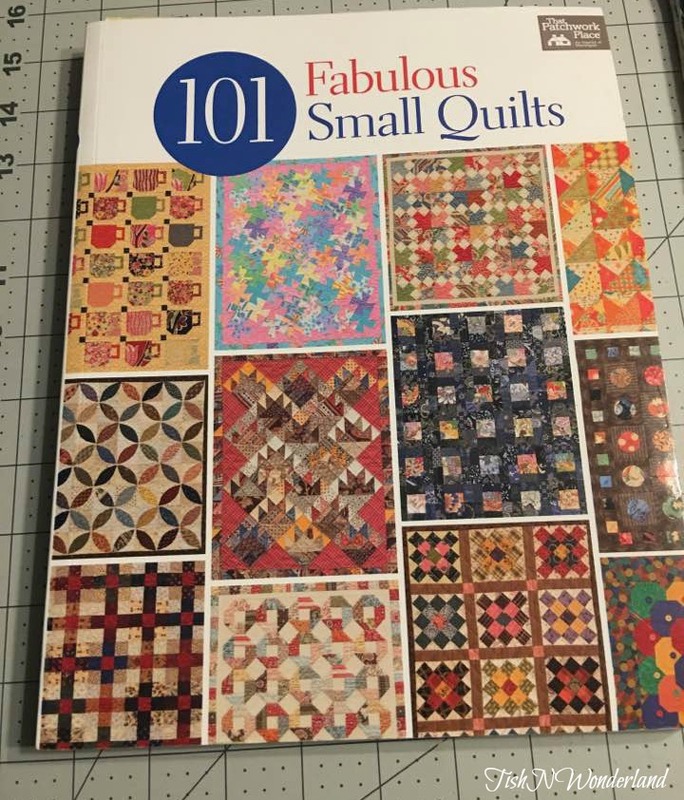 I've found that she and David share similar tastes when it comes to quilting. I texted the same information to see what her thoughts were. I decided if she likes it, I'm going for it (I needed a break from the Butterfly Quilt and decided this little project might be a great recharger). If she said, eh, back to the drawing board. Guess what? She loved it. So Monday evening, quilting commenced. David's design required absolutely no marking and could easily be achieved using quilting rulers. My thread choice was Aurifil 2021 Natural White. 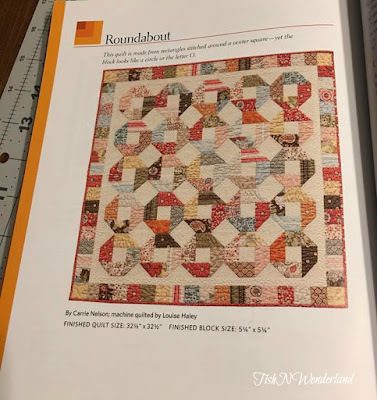 I could tell you I chose this thread because, as a white, it is a wonderful neutral and would play nicely across the quilt (which it does), but the fact that my machines (piecing and quilting) where already threaded with this colored helped too. I could have just as easily chose 2908 Spearmint or even 2405 Oyster. My point there are always lots of choices. 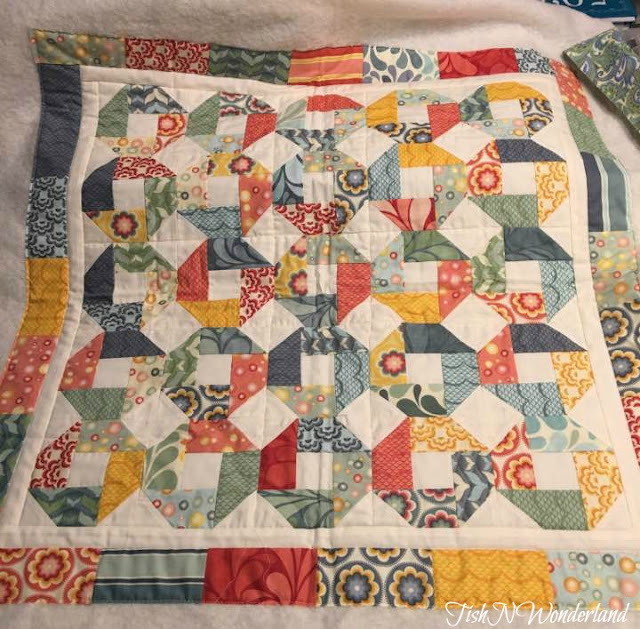 After a few laps around the quilt with my walking foot I headed to my Handi Quilter Sweet Sixteen to finish up. After I had the bottom section finished, I pulled it off to have a look. Not bad at all, though it's really hard to see some of the details. Several interruptions later I had a finished quilt top. A quick trip to the quilt shop at lunch and I was able to find a solid fabric that matched the quilt pretty nicely. 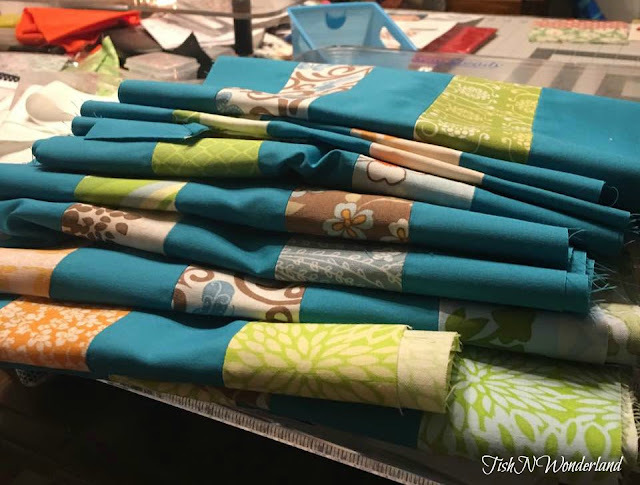 After dragging myself in after the homecoming parade and pep rally, a quick stop at the Dollar General (non quilting related) and five 2 1/2" strips later, I had myself a bound mini quilt and one item crossed off a list of many. This finish feels GOOD. I really didn't have any expectations for this little project, but I absolutely love how it turned out. If you are having trouble figuring out how to quilt something, don't be afraid to ask a quilting buddy for help. Most importantly, don't be afraid to step outside your comfort zone. Sometimes the vision of someone else isn't as clear to us in the beginning. This little 20 minute photo shoot happened right after getting off of work and rushing to my friend's house for a little evening out. 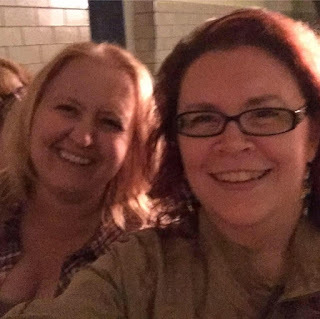 Last night she and I went to a live production of The Rocky Horror Picture show performed by our local theater group. The same group that preformed the musical Quilters two years ago. Talk about two very different shows, but one AMAZING group of performers. Needless to say, a good time was had by all. We knew many of the performers in the show and virgins that were drug to the stage. If you have ever seen a live performance you will understand that last reference. Sometimes you just need an evening to let go and have fun. Thank you Lori for dragging me out of the house and making me be social. 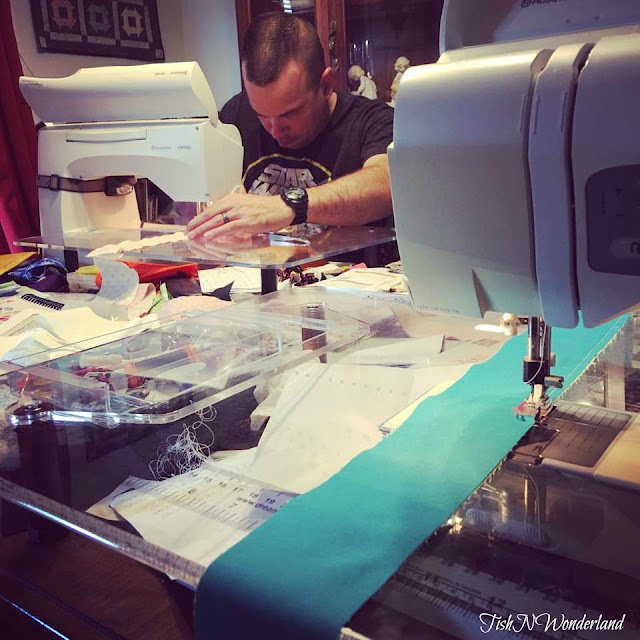 When left to my own devices, I would have chose my sewing machine. Today I'm linking up with TGIFF, Finished or Not Friday and Can I Get A Whoop! Whoop! Sometimes I think we can all benefit from a squirrel. A happy distraction. I found one this week in the form of an old UFO. I'm not sure it's a DrEAMi moment, but it is definitely helping me recharge my batteries. I'll tell you more about it on Friday, because it should be a complete finish by then...fingers crossed. So what can I tell you about? David and I took a jaunt to a quilt shop almost two hours away this weekend, so that he could get some border fabric for a quilt he has been working on. The weekend before he pieced together a Carpenter Star Quilt in civil war reproduction fabrics he fell in love with. Seven days later, he decided it needed borders, so off we went. So by that evening he had a quilt top that he was in love with. The problem for me...he's piecing quicker than I can quilt. That's okay, I have a homework assignment for him this weekend. He can still piece, but it will be for me. While at the shop, I took a gander at the fat quarter stash in the back. The Aurifil BOM is in the downhill swing with only four more blocks to go. I thought I would look for potential pieces to help me get around the color wheel. 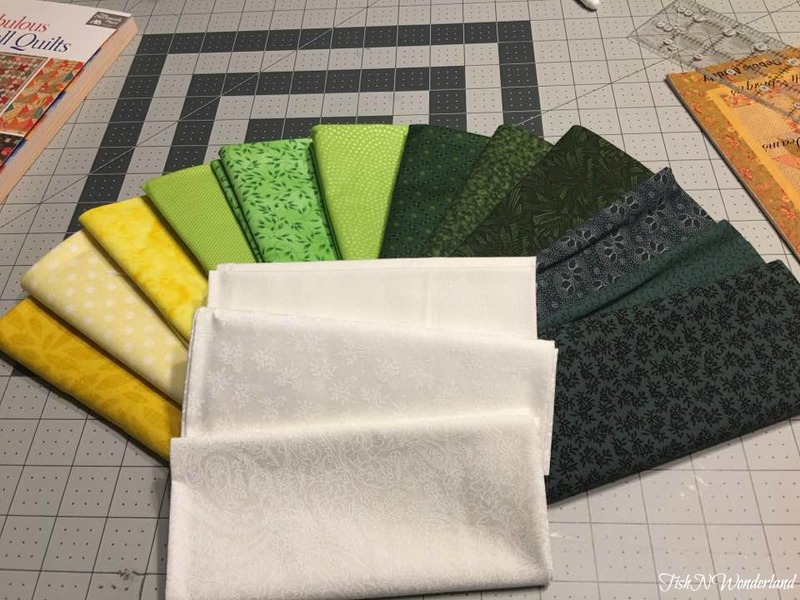 I think I scored some lovely yellow, yellow-green, green and blue-green fat quarters. I can't wait to piece them up into blocks over the next four months. I can also now share with you my pieces in the next step for Cheryl at Meadow Mist Design's Magnolia Mystery Quilt. 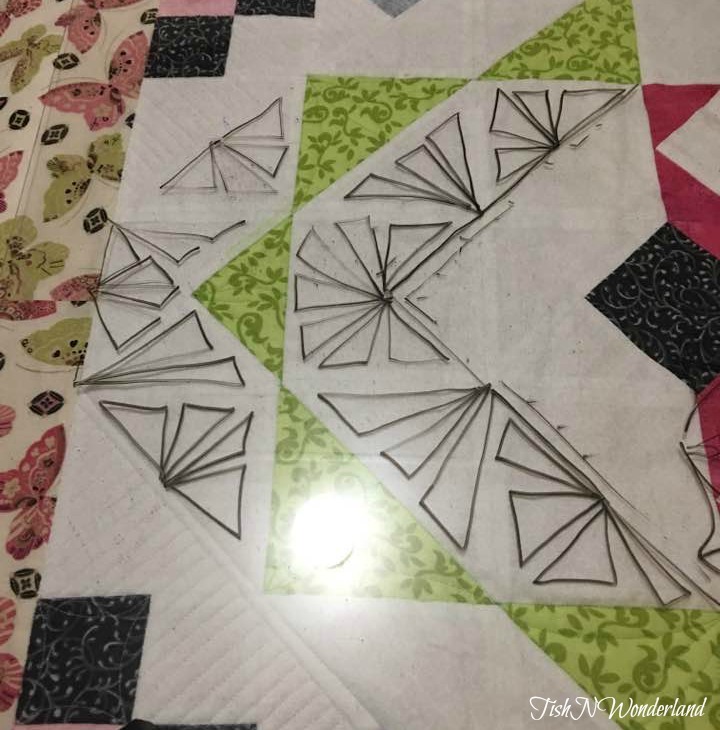 Last week she posted the instructions for the first cutting bits...half square triangles. Below are my fabric A/D half square triangles and some confetti bits that were left over. I'm still quilting on the Butterfly Meadow Mystery Quilt. I had to take a bit of a break to figure out my next quilting moves. I'm quilting it do death the life into it, did I mention that? I think some of these ideas will stay and some will still be changed. Depends on what I'm feeling when the machine is threaded and I'm setting in front of it. Oh and David's homework assignment? He doesn't actually know it yet, but I'm going to ask him to piece another Star Cross mini quilt for me. This time maybe add borders? You can read about the original one here. The Upshur County Art Alliance is having a fundraiser at the end of September and has asked for donations from local artists for a silent auction. They do a wonderful job promoting the arts in our area and I would love to help them out. If he will piece it, I will gladly pull out the rulers and quilt it. Guess the ball is in his court now. No pressure. I will be interested to see what else gets accomplished this week. It is Homecoming at our high school, so that means a parade and pep rally tonight, the game on Friday evening and a dance for the kids on Saturday. It should be a full week with lots of running. Can I pre-schedule my Sunday nap now? Hope everyone has a wonderful week and tune back on Friday for my hopeful UFO finish. Since I'm not quite finished with the quilt I have been quilting, I thought I would share a quick baby quilt tutorial. You may remember this quilt finish from about two weeks ago. A simple baby quilt that is now safely delivered to its new owners, waiting for the sweet baby girl to arrive. Long story short, after being commissioned to make a baby quilt in purples and greens I needed something simple and quick. After doing a few drawings for the customer, like a nine patch and a bar quilt, I came up with this woven design or a play on the rail fence block. 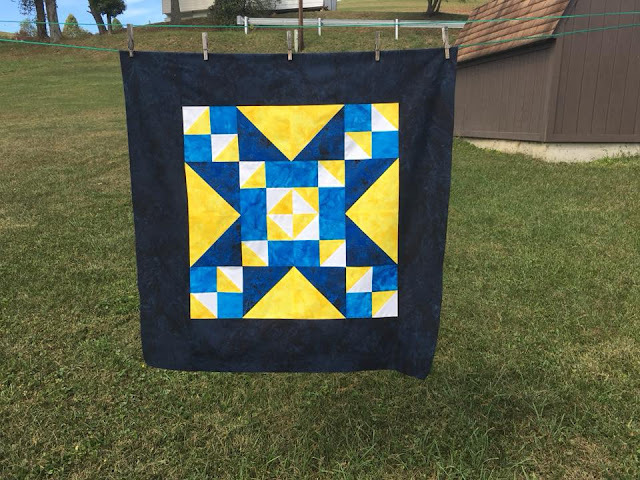 The customer loved the look of this quilt and so this was the road we traveled down. Construction of this quit is super quick and easy. Perfect for that last minute I need a shower gift and I need it like TOMORROW! 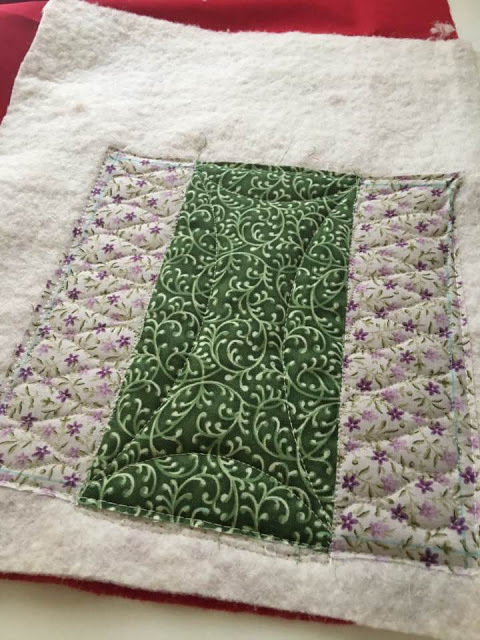 For my quilt I chose to use one light purple and light green fabric, but used two different dark green and purple fabrics. For the purpose of this tutorial, I will write it using just one dark green and purple. Sew all seams using a scant 1/4"
Pattern based on width of fabric (WOF) measuring 44"
Really there are two different ways you could construct the blocks for this quilt. Both are super easy, so I have decided to include instructions for both methods. Sew one of the light green 2 1/2" x WOF strips to each side of one of the 4 1/2" x WOF dark purple strips. You will need make two of the strip sets below. 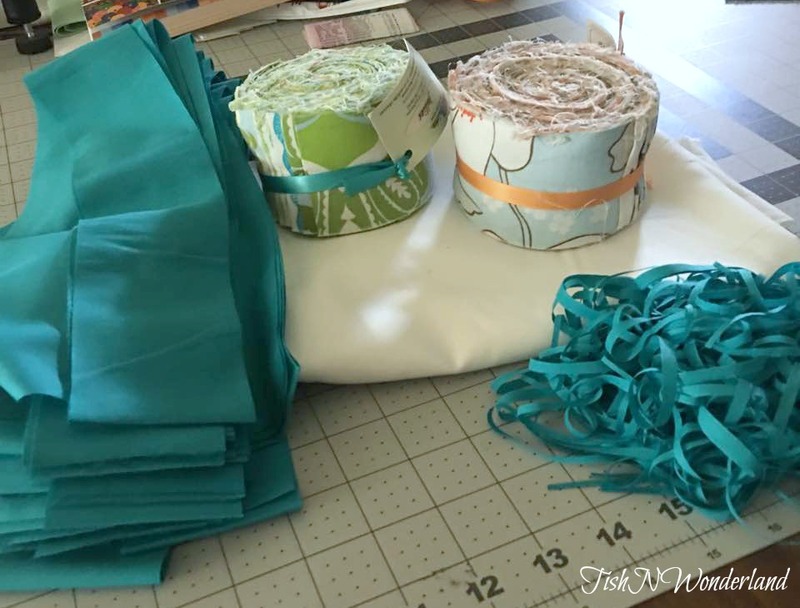 Sew one of the light purple 2 1/2" x WOF strips to each side of one of the 4 1/2" x WOF dark green strips. You will need make two of the strip sets below. Next using your cutting ruler, trim each strip set to 8 1/2" blocks. You should be able to get five from each strip set. You should have a total of 10 light purple/dark green and 10 light green/dark purple blocks. 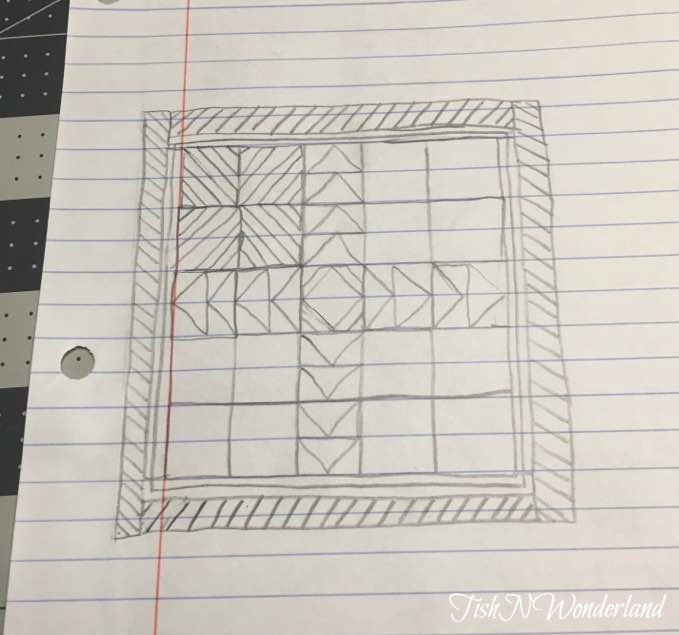 I decided to include instructions for just piecing each block one at a time. Why? I actually prefer this type of construction, because sometimes, when I'm working with strips, my strips can get a bit wonky. I know I should slow down and do a better job cutting. Using your light green and light purple 2 1/2" x WOF strips, cut each strip into five 2 1/2"x 8 1/2" rectangles. You should have a total of 20 light green and 20 light purple 2 1/2" x 8 1/2" rectangles. Next, using the 4 1/2" x WOF dark green and dark purple strips, cut each strip into five 4 1/2" x 8 1/2" rectangles. You should have a total of 10 dark green and 10 dark purple 4 1/2"x 8 1/2" rectangles. Sew a 2 1/2" x 8 1/2" light green rectangle to each side of the 4 1/2" x 8 1/2" dark purple rectangles to form 10 of 8 1/2" blocks below. Sew a 2 1/2" x 8 1/2" light purple rectangle to each side of the 4 1/2" x 8 1/2" dark green rectangles to form 10 of 8 1/2" blocks below. 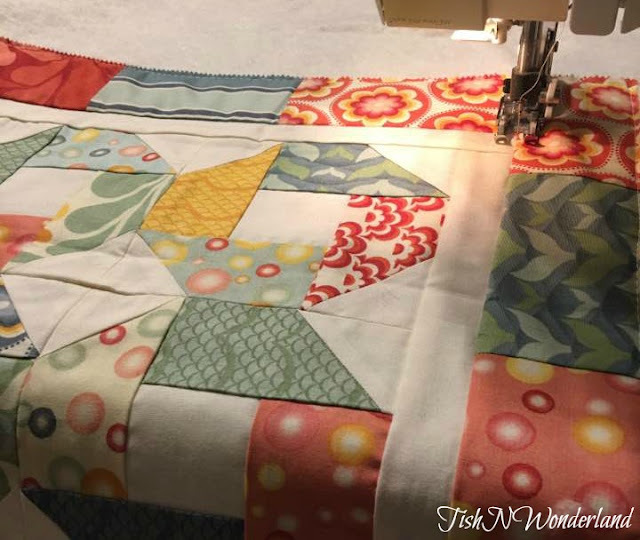 Once you have the 10 light green/dark purple and 10 light purple/dark green blocks pieced you can begin piecing your quilt top together. Arrange the blocks similar to the diagram below. 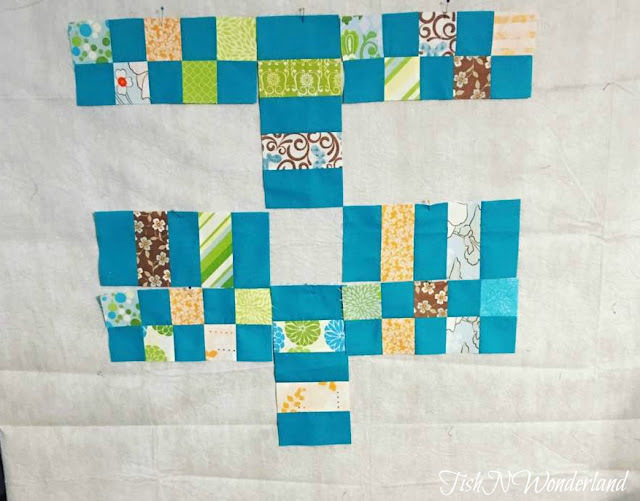 Your quilt should be five rows of four blocks. I promise in no time your quilt will come together. For my quilt, I chose to do a simple all over stipple. It provided a wonderful texture, keeping the quilt super soft. The best part? The quilting only took around 45 minutes. 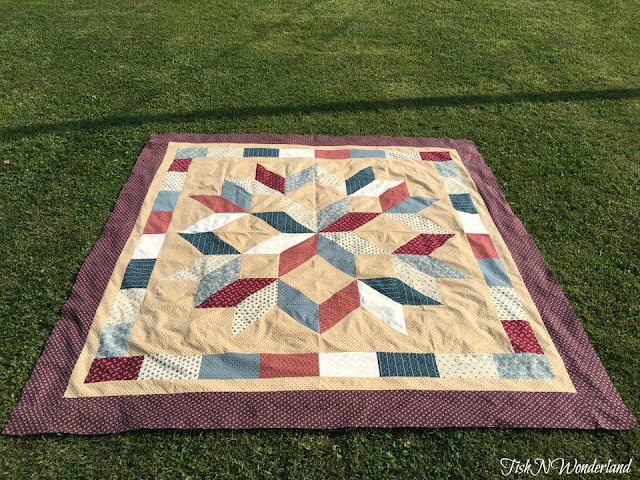 It would also look great just stitched in the ditch or adding some straight line quilting. Trade in those stipples for all over loops. You could even go crazy and add some ribbon candy and continuous curves. What ever you decide on, it will look great and you will have a finished baby quilt in just an afternoon's time. If you decided to whip one of these little quilts up, feel free to tag me on Instagram (@tishnwonderland). I would love to see what you create. Bonus points if there is a baby in the picture. I hope you have enjoyed this quick and easy tutorial. That's my sort of finish for the week. Next week, I'm hoping to be able to share my guild's outdoor quilt show on Sunday (weather permitted) and maybe a Meadow Mystery finish (fingers crossed). To all of those, in Irma's path, please stay safe this weekend. She will be headed my way, but will be much more timid and forgiving by the time she reaches our mountains and crisp cooler air. Sending love to you all. Today I'm linking up with Main Crush Monday, TGIFF, Finished or Not Friday and Can I Get a Whoop! Whoop!